Zapier integration is one of the most requested features for power users of Mautic who would like to push data from Mautic to other apps and vice versa. Since Mautic is still a relatively new marketing automation software in the marketplace, many apps you use in your sales & marketing stack are probably still developing native plugins for Mautic. With each new release, the Mautic team usually announces added and/or improved integrations with other apps including other CRM and email tools. The Salesforce CRM integration is always getting new features including most recently, the ability to merge duplicates, segment contacts synced from Salesforce and view timelines in one-click from a Salesforce field. 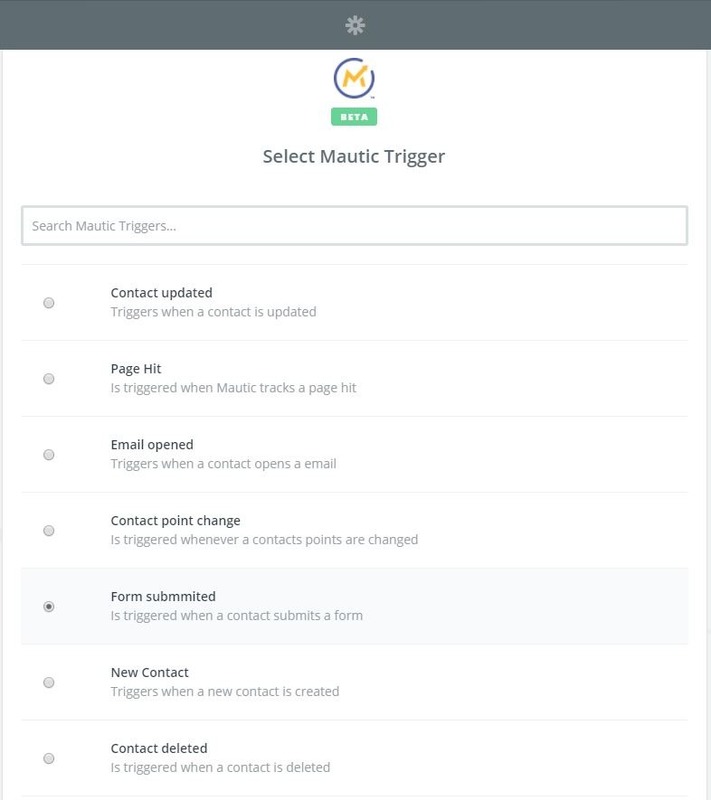 Mautic also added support for two-way sync with HubSpot CRM, making it easy for former HubSpot users to switch while keeping the free CRM component. Although Mautic’s integration support is growing, sometimes it still needs a helping hand from a tool like Zapier. Zapier supports hundreds of web apps, acting as an intermediary between Mautic and other apps in lieu of a Mautic official or 3rd party plugin. You create workflows, called “Zaps” with at least one trigger app and one action app. If you’ve used personal automation solutions such as IFTTT, the concept will be familiar. When the trigger app (e.g. Mautic) posts a webhook to Zapier, the Zap is set in motion. Like its name would imply, the action app receives the data posted by the trigger app to Zapier and performs an action you specify. Let us clarify this with an example or two. 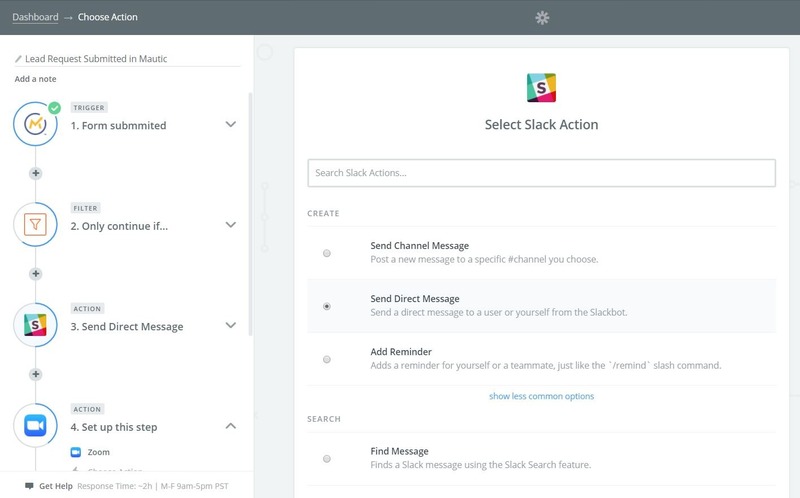 Alert a sales user in Slack. Add the data to a Google Sheet. Create an opportunity in your CRM of choice. Send a Google Calendar invite to everybody involved. Using Zapier’s built-in utilities, you can set up conditions that influence the actions based on any contact field in your Mautic instance. For example, you might want to route leads in a different province/state to a different BDR responsible for that sales territory, and only trigger the actions based on certain Mautic form completions and not others. With Zapier, you can automate entire business processes behind each web app in your stack. With the Zapier integration for Mautic, you are literally automating your marketing automation software — How great is that? Compatibility: Any version with Mautic API v2, working up to Mautic 2.8.0. 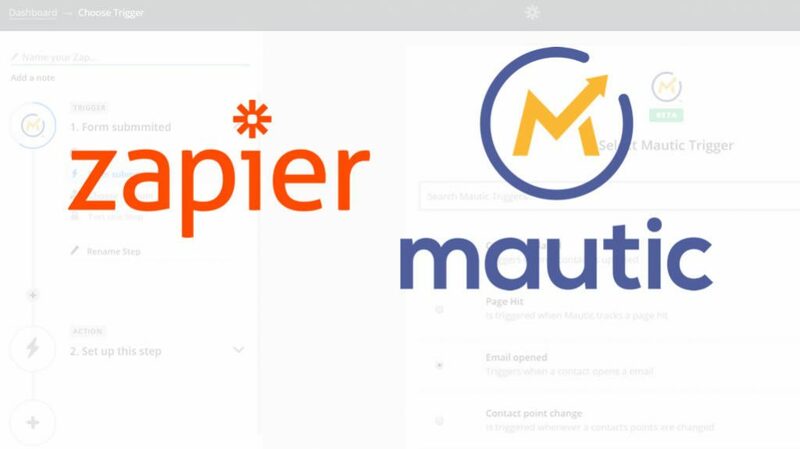 The Zapier Integration for Mautic is in beta, so you need to be invited to use it. The integration began as a community contributed plugin by zpetterd. Over months and dozens of posts of discussion, the integration is now officially maintained by the Mautic Team. Update July 2017: The Zapier app for Mautic is out of beta with Mautic 2.9. The link below is still valid, and you may also refer to the video at https://mautic.com/help/set-zapier-integration/. 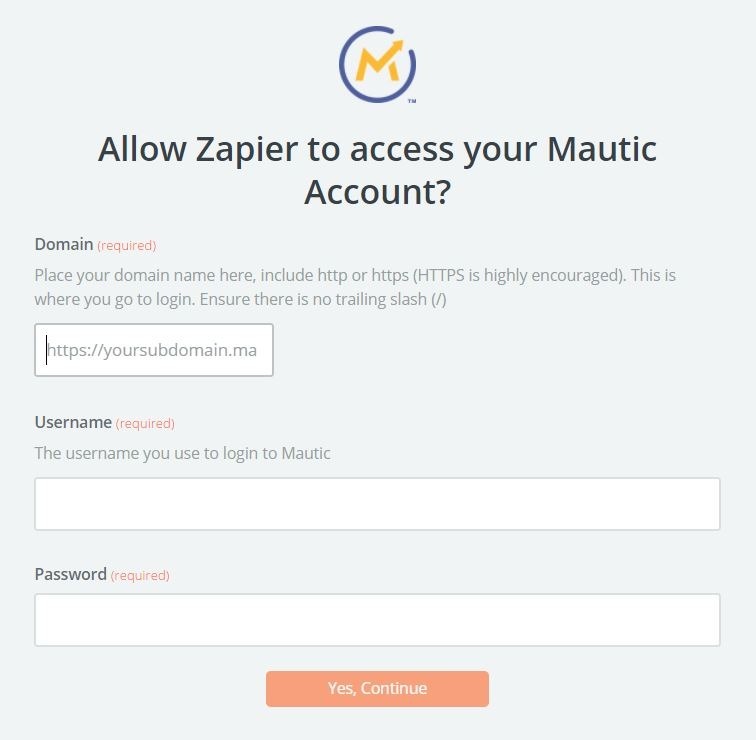 You won’t be able to find the Mautic app in your Zapier dashboard until you click on this special link to add it to your account. Accept the invitation from Mautic founder David Hurley, and you’ll be off to the races. If you don’t have a Zapier account, you can create one for free. It’s a 14-day free trial during when you’ll able to create an unlimited number of multi-step Zaps. After 14 days, you can use the free plan which allows 5 Zaps with up to two steps each, or upgrade to a paid subscription. As an example, here is how to create a Mautic Zap triggered by a form submit. Accept the invitation to the official beta Mautic Zapier hook-in. Mautic: Enable the Mautic API and HTTP Basic Auth in Configuration > API Settings. For security reasons before setting “Enable HTTP basic auth” to “Yes”, it is strongly recommended to install an SSL certificate on your server. Contact us for assistance. Zapier: Name your Zap and choose the Mautic Trigger you require, in this case “Form Submit.” Click Continue. Click “Connect a New Account” and in the pop-up window, enter your Mautic URL including subdomain and/or subdirectory (with no trailing slash), Mautic username and password. Test the OAuth connection, and click Continue. Mautic: Open the Settings pane in your Mautic dashboard and click “Webhooks”. Add a New webhook, name it something meaningful like “Zapier – Form Submit” and activate the “Form Submit Event” checkbox. Copy and paste the webhook URL from Zapier, then hit Save & Close. Click Continue in the Zapier wizard. 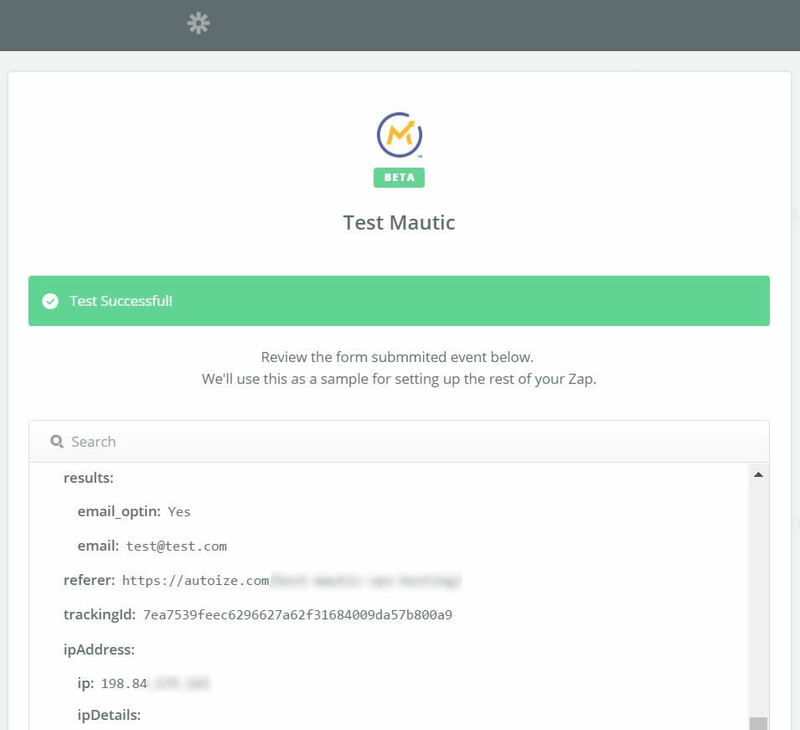 Zapier: Test the webhook by submitting a Mautic form. Assuming you did everything correctly up to this point, you should see “Test Successful!” in Zapier. If you click the “View your form submit event” link, you can view the raw data posted to Zapier by Mautic. It’s impossible to cover all of the use cases that are possible with the Zapier Integration for Mautic. That’s why our consultants can provide support setting up your Mautic instance with Zapier, and creating multi-step Zaps that facilitate your business processes using Mautic contact data in your other applications. Browse the 750+ apps supported by Zapier.